This post has already been read 8488 times! KEARNEY – The University of Nebraska at Kearney Athletic Department has chosen Kathy English as recipient of this year’s Joan Bailey Award for the Advancement of Women’s Athletics. English was honored Saturday at the Loper women’s and men’s basketball games against Northeastern State. “Three years ago, we announced the creation of the Joan Bailey Award for the Advancement of Women’s Athletics. This award is named in memory of Ms. Joan Bailey, a pioneer in women’s athletics,” said UNK Athletics Director Paul Plinske. “It brings me great joy to honor Kathy with this distinguishable recognition. Currently a lecturer in the Athletic Trainer Education Program, clinical supervisor and Certified Athletic Trainer in UNK’s Kinesiology and Sport Sciences Department, English has held a variety of positions since joining Kearney State College in 1980-81. 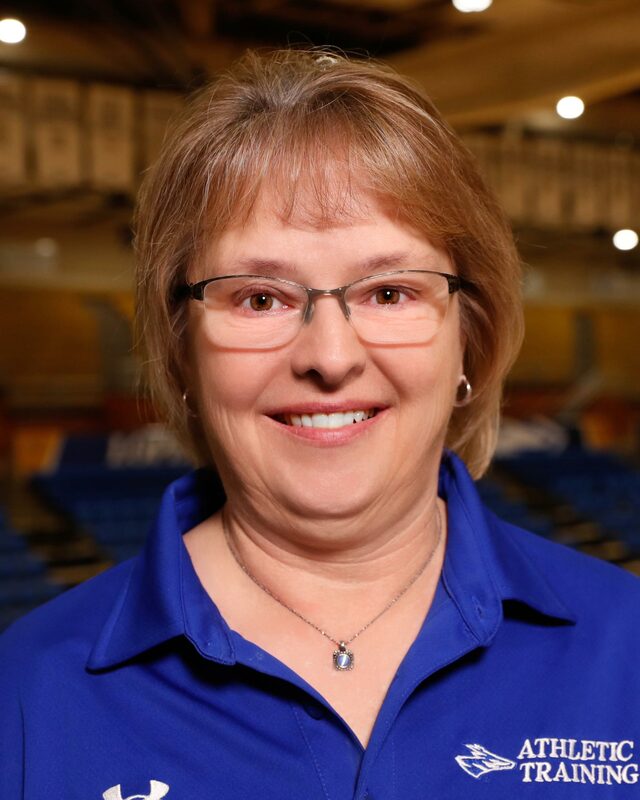 She began as a lecturer and assistant athletic trainer before becoming the Lopers head athletic trainer from 1981-1993. During this 12-year period, she also served as the athletic training internship director. 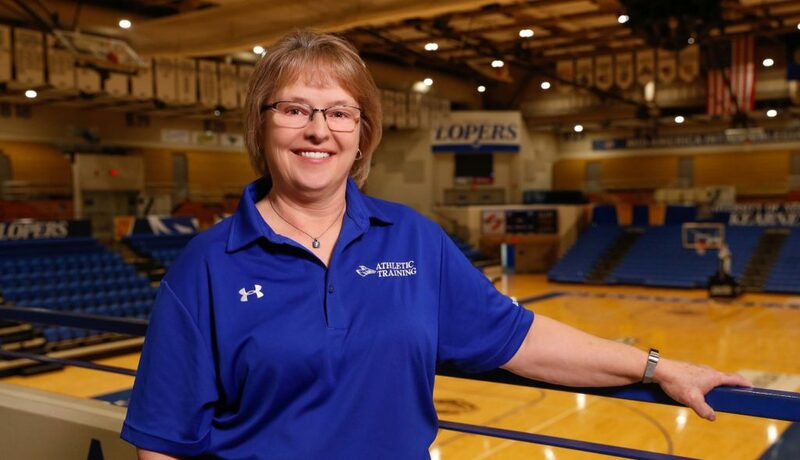 Working with all 17 Loper varsity athletic programs, English served as head athletic trainer at the National Association of Intercollegiate Athletics Association women’s basketball and track and field national championships. She received an NAIA Serviced Award in 1985. Seeing the Lopers transition from NAIA into NCAA Division II, English helped design the functional floor plan for the current UNK Athletic Training room. She also was instrumental in the foundation of the Internship Athletic Training Program at KSC. “Kathy recruited me at our District 5 Athletic Trainer’s convention in the spring of 1992 to become a graduate assistant at UNK in the fall. I soon realized, and was extremely impressed, with the internship program that she had established,” said Assistant Athletic Director for Sports Medicine Bill Murphy. “She treated her student-athletes and coaches with the utmost respect and class. She is well respected and admired, not only in the community, but also at state and national levels. Kathy truly represents the best of what all young athletic trainer’s should aspire to be. In 1993, English became director of athletic training services and remained as a lecturer in the classroom. She continued her involvement with Loper Athletics by serving as assistant athletic trainer from 1995-2010. English also was UNK wellness director for two years and became an ATEP clinical coordinator in 2002. That year saw her also assist with the administration of the CAATE Accredited Athletic Training Education program at UNK, something she still is involved with. Working as an athletic trainer annually at the Nebraska State High School Cross Country meet, English also served as a volunteer athletic trainer for Sumner-Eddyville-Miller High School and Fort Kearny Conference high school activities. English was the first female inducted into the Nebraska State Athletic Trainer’s Association (NSATA) Hall of Fame, earning that honor in 2002. A year earlier, she was the first female inducted into the Mid-America Athletic Trainer’s Association (MAATA) Hall of Fame. Prior to these awards, she was tabbed as the 1989 George F. Sullivan Athletic Trainer of the Year and won an Outstanding Achievement award from the NATA College/University Student Athletic Trainer Committee in 1992 and again in 1993. “Since 1980 Kathy has been a pioneer for women in athletic training, not only at KSC/UNK, but for the state of Nebraska. She was instrumental in developing the student athletic training internship program. This program allowed her to educate and train hundreds of students who have gone on and become Certified Athletic Trainers,” Murphy said. “In addition to directing the internship program, she directed all the sports offered by KSC and UNK. Martha “Joan” Bailey (1928-2010) was considered one of the pioneers of women’s athletics at Kearney State College and the University of Nebraska Kearney. 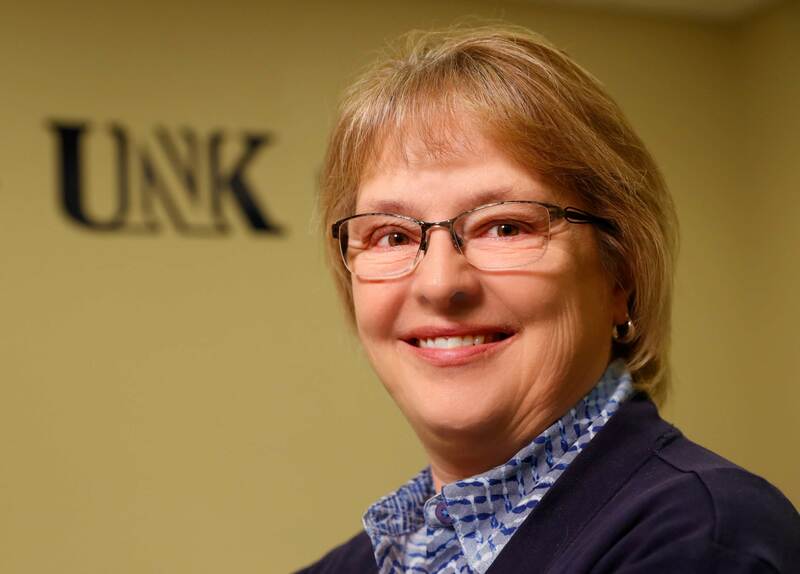 Bailey was instrumental in the organization and funding for women’s athletics at UNK. She fought for female opportunities and served as an advocate for women in a pre-Title IX world. The Joan Bailey award was established in 2014 in her memory and is presented to an individual or group who has made significant contributions to the development and advancement of women’s sports in general and to UNK. The individual or group has, through personal achievements or influence, inspired girls and women to become more responsible in their own health through fitness, physical activity or sports. The award is earned by the demonstration of a continuing, lasting and dedicated commitment to improving the lives of girls and women through fitness, physical activity or sports. Career Path: Lecturer / ATEP Clinical Coordinator / Athletic Trainer, University of Nebraska at Kearney, 2010-Present; Lecturer / ATEP Clinical Coordinator / Assistant Athletic Trainer, UNK, 2002-10; Wellness director, UNK, 2000-02; Lecturer / Assistant Athletic Trainer, UNK, 1995-2002; Lecturer / Director of Athletic Training Services, 1993-95; Lecturer/ Head Athletic Trainer/ Athletic Training Internship Director, Kearney State College and UNK, 1982-93; Lecturer/ Assistant Athletic Trainer, KSC, 1980-81; Physical Therapy Aide / Athletic Trainer, Kearney Clinic, 1980-81; Graduate Assistant Athletic Trainer, Eastern Illinois University, 1979-80. Family: Husband, Dana; Children Lindsay Meier and husband, Preston, and Lance English and wife, Brielle; Stepchildren Georgia Eatherton and husband, Jeremy, and Ashley Blausey; Grandchildren Madison Eatherton, Taylor Eatherton, Skyelar Bausey, Journey Blausey and baby boy Meier (coming in March). Hobbies/Interests: Anything outdoors. Sports have been a mainstay of my life, but as I have ‘matured’ I now watch more than I participate. I find a good long bike ride or walk in the park to be just as engaging for me. … I enjoy being a farmer’s wife – occasionally helping to fix fence, move the cattle and driving the tractor in the field. … We have just purchased a small camper, so I look forward to the adventures ahead. Share something about yourself that few people know? I was a pretty good athlete ‘back in the day.’ I loved playing softball, basketball and even backyard football, but interscholastic athletics for females was just beginning to evolve at the time. Track was the only sport that provided a competitive opportunity, so in junior high and early high school I ran on the AAU Nebraska Track Club with college-aged women. Best career advice you received? Who gave it to you? Without a doubt, it is the opportunity to develop relationships with others (athletes, students, coaches, administrators, Drs., therapists, ATCs, etc). I have been blessed. My career has offered me the opportunity to apply my knowledge and skills to help make a positive difference for others. And with this, I have developed life-long acquaintances and close friends. The diversity of the work that I have done ensures that no day is like any other. Sports seasons always change, and with that comes fresh new challenges. Throughout my career with athletes, coaches, administrators, students, medical personnel and others, I believe I have shown that I am passionate about athletic training as a health career profession. I am sincere at heart and have always tried to be very genuine in my interactions. I consider myself to be fairly consistent and faithful to my responsibilities and endeavors. I am also adaptable, as I have ‘weathered’ a great deal of change within the profession of athletic training and the athletic world, as well as institutionally here at UNK. Where is your favorite place to visit on campus? Foster Field on game day. I always loved the awesome feeling I would have to be on the sideline, in the thick of things with the Lopers on game day. Biggest challenge you faced in your time at UNK? Probably my transition from the actual clinical practice to full-time teaching within my field. I still miss the interaction with the athletes/ coaches and athletic training students in clinical practice, and of course game day excitement. Although I am passionate about teaching students within the field of athletic training, there is a small part of me that was left behind in the training room. What is your fondest memory of UNK? I really cannot pick just one. I am forever grateful to administrators and colleagues who have touched my life for enabling me to pursue my career. I am blessed by so many supporters along the way. Thank you, thank you, thank you. What qualities make someone successful in your position? Having supportive administration and dedicated colleagues who have allowed me to do my job to the best of my ability. Being a ‘difference’ maker – focused, passionate, dependable, consistent. Believing that ‘every person matters’ – empathetic, relational oriented, a good listener. At one point in my career, I did consider returning to school to pursue physical therapy. I chose not to for a variety of reasons, but the biggest one was that I knew that I would not be happy in a clinic/ hospital setting. Being able to be ‘out’ with the athletes during practice as well as in the athletic training ‘clinic’ was where I was meant to be. I am blessed that the athletic training career found me. I did not know what I really wanted to do with my life out of high school. I had attained an associate’s degree as a Medical Assistant but did not want to be with ‘sick’ people all day so, much to my parents’ dismay, I really did not pursue the job market very hard. I enjoyed sports so much, but at the time there were not many opportunities for females. My father always encouraged me to become a PE teacher, but I wasn’t sure that was the path I was really passionate about either. Heeding his advice, I returned to school and began coursework in physical education at Kearney State College. That first semester, I enrolled in an anatomy/kinesiology course taught by Paul Bishop, who at the time was the head athletic trainer. Paul recognized my interest in understanding the human body offered me an opportunity to ‘work’ as a student in the training room and I was ‘hooked’ from that point on. What is your favorite thing about UNK? The family atmosphere. The support of faculty, staff and administration has been essential in allowing me the opportunity to be a ‘difference maker’ as both an educator and health care provider. I was a student trainer at KSC under Kathy’s supervision from the fall of 1986 to the spring of 1992. She is a great teacher, mentor and more importantly even better person. Thank you Kathy for what you have done for me and KSC/UNK.